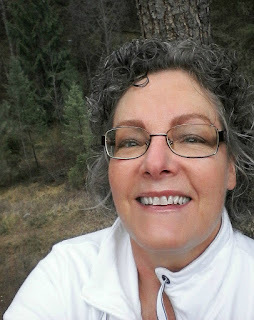 Hello, it's Deb Riddell here with you today and I am thrilled and honored to be guest blogging here at StencilGirl Talk! 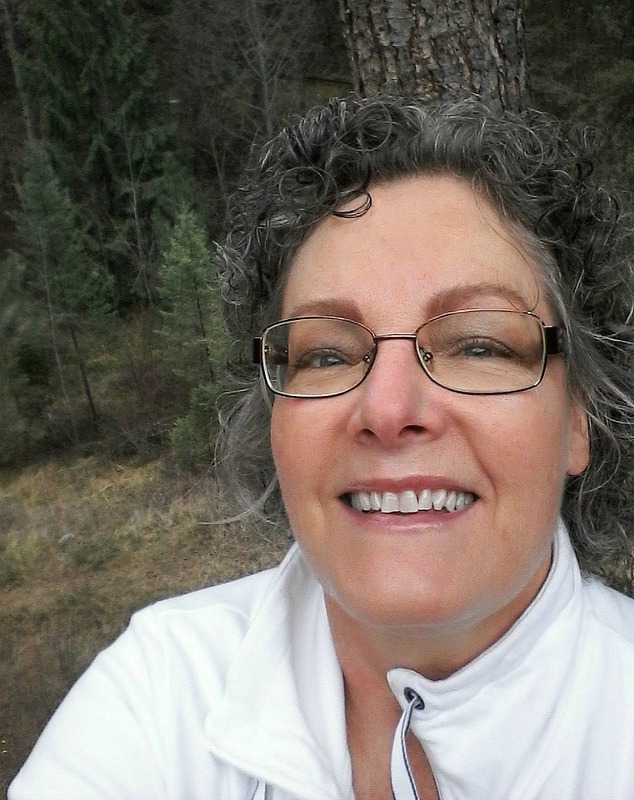 A huge thank you to Mary Beth Shaw and her amazingly talented team for asking me to create a project to share with all of you. 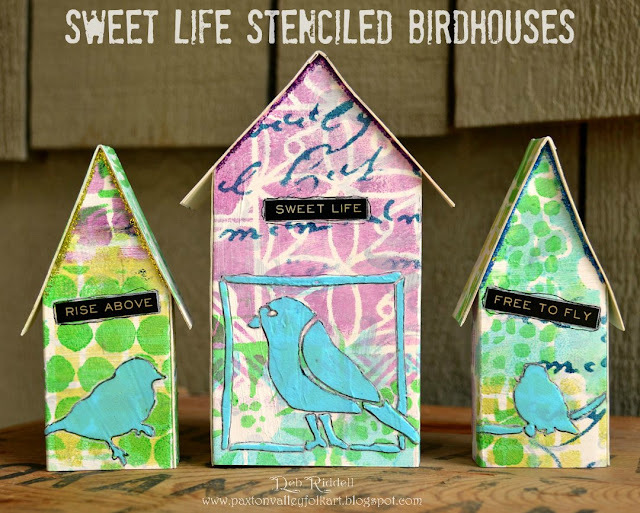 I used a whole bunch of StencilGirl Products stencils and Tim Holtz's Tiny Houses die to create a little trio of Sweet Life Stenciled Birdhouses. I started out with a piece of unloved 12" x 12" scrapbook paper from my stash, covered it with a thin coat of white gesso and then stenciled the paper randomly through the Rectangular Patterns For Play, Circular Patterns For Play and Doodle It Bigger stencils with three transparent colors of DecoArt Media Fluid acrylic paints (Cobalt Teal Hue, Green Gold and Quinacridone Violet). 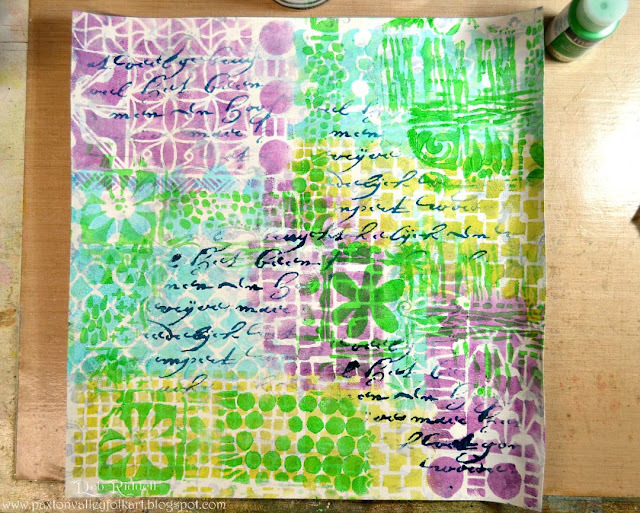 More stenciling followed through the Tropical Floral stencil with Yellow Green Light acrylic paint and through the Rembrandt's Words Small stencil with Prussian Blue Hue. from the stenciled scrapbook paper. I scraped some shavings of Dry Ice Gelato into Ranger Opaque Matte texture paste, mixed it well with a palette knife and then stenciled some birds onto the fronts of each of the die cut houses. 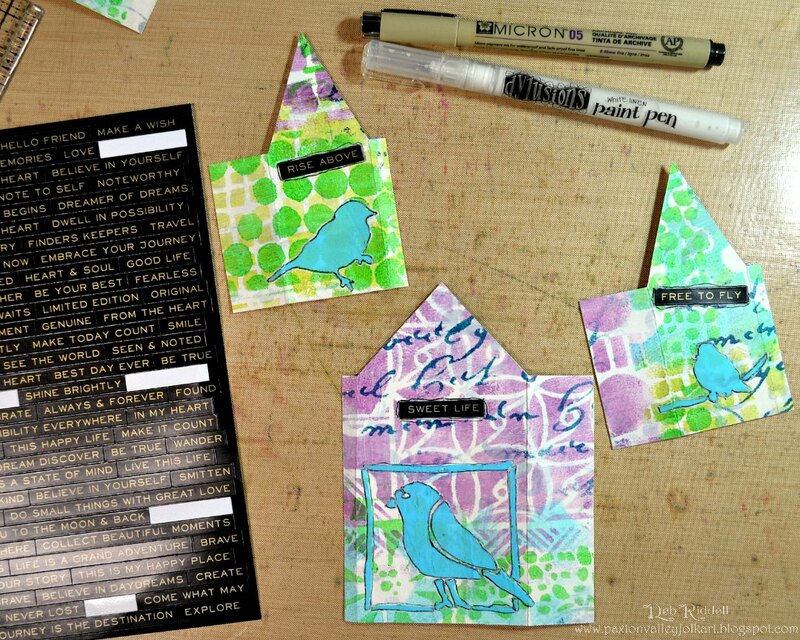 I used the Black Birds In Trees, Song Birds and Nature's Gathering stencils. 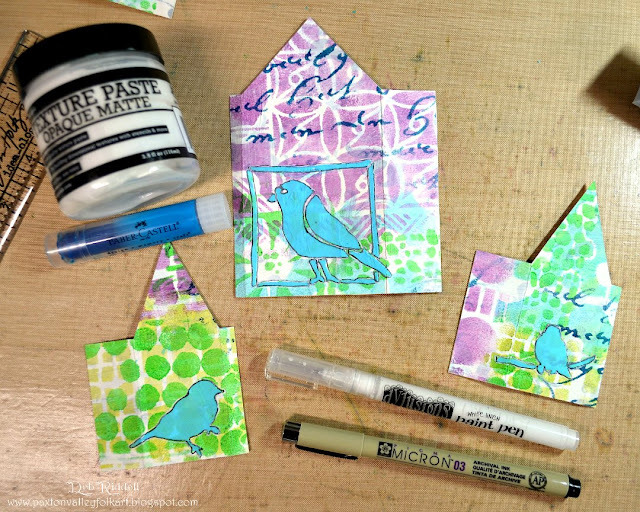 Once the texture paste had dried, the stenciled birds were outlined with a black Micron pen and a white Dylusions paint pen. 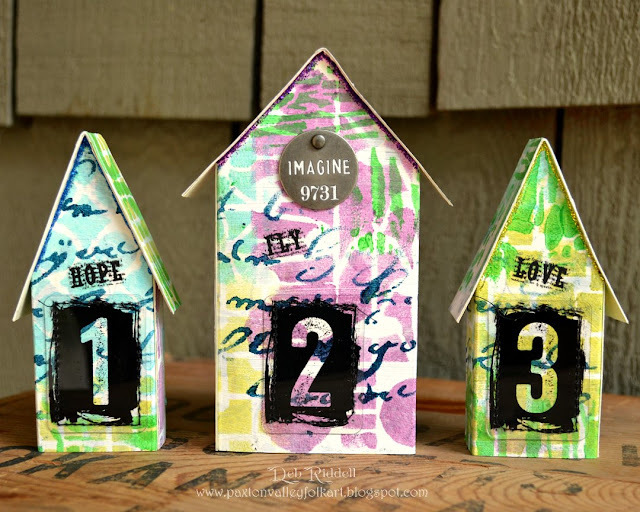 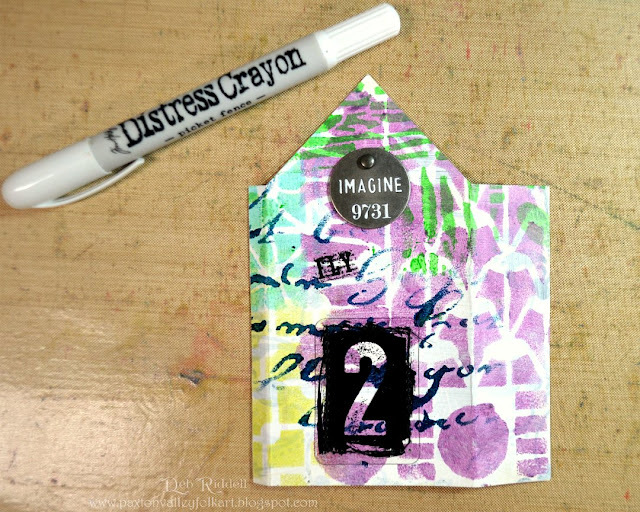 Three sentiments from Tim Holtz's Quotations Metallic Stickers were chosen, adhered to each of the houses and outlined with the same two pens as above. 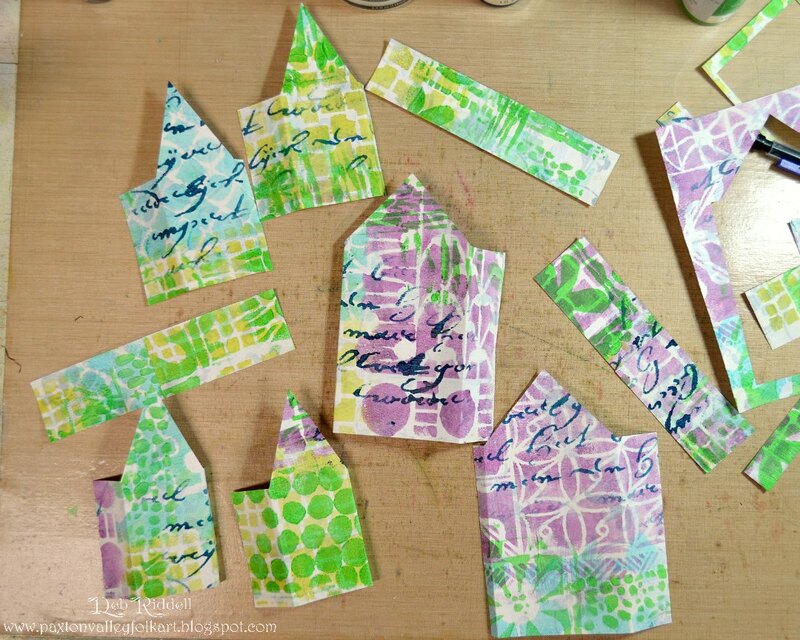 On the back of each die cut house, Transparent Alpha Tiles were sewn on with a sewing machine. 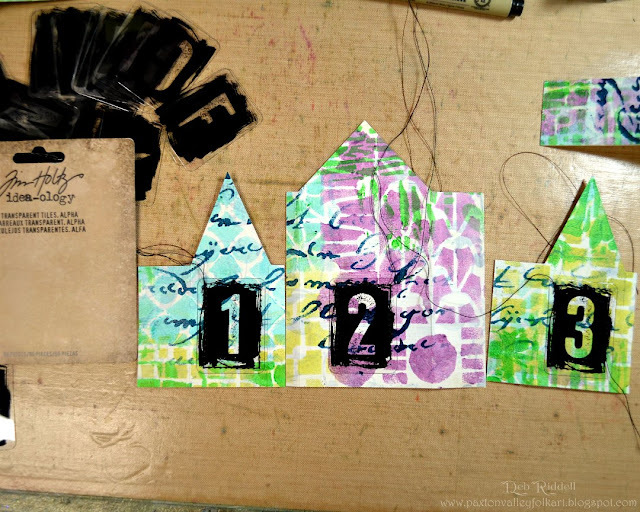 Some words were chosen from Tim Holtz's Words Remnant Rubs and added above the tiles. and added to the top of the largest house with a brad. The houses were then assembled, a line of glitter glue was added underneath the eaves of each little house and the Sweet Life Stenciled Birdhouses were complete! 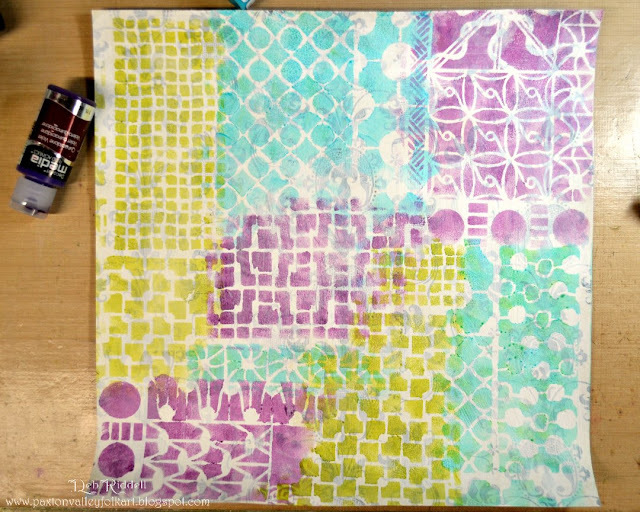 I hope that you've enjoyed seeing how my project came together and a huge thank you again to StencilGirl for inviting me! I had so much fun playing with all of their wonderful stencils! 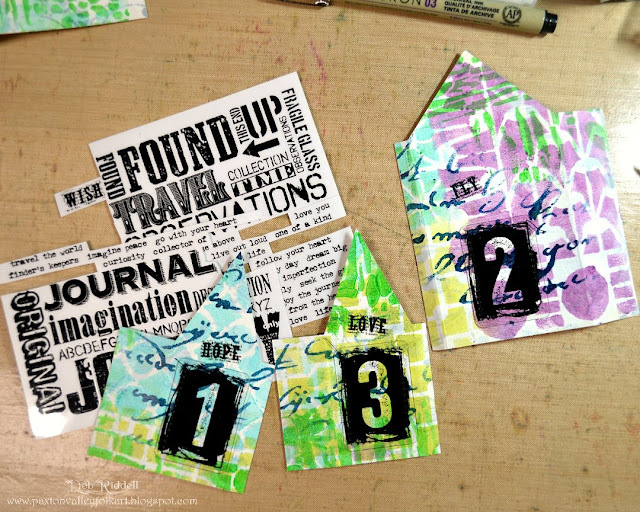 Thanks so much for stopping by today to see my project and happy creating! Absolutely delightful tiny houses - such pretty backgrounds, and those birds are adorable.